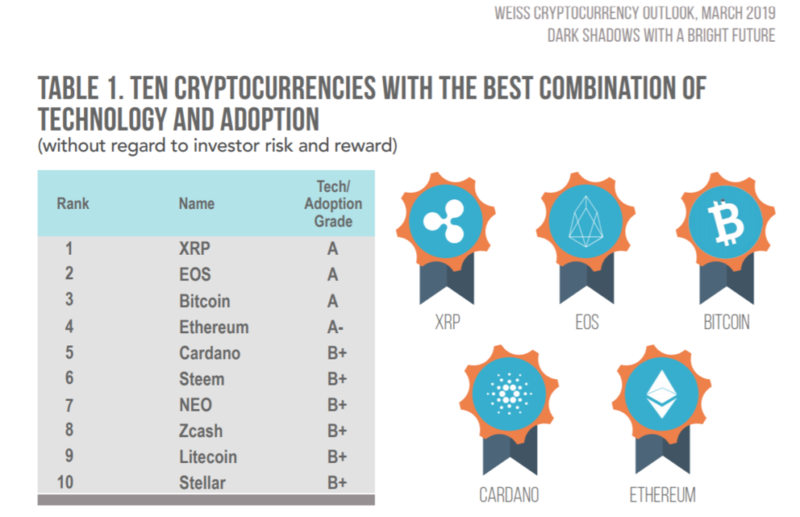 Weiss Crypto Ratings released the names of cryptocurrencies it considers most likely to succeed in 2019. The independent ratings agency has given Bitcoin an A “tech/adoption” grade along with Ripple’s XRP and Ethereum-competitor EOS. Weiss evaluates cryptocurrencies combining two factors, the adoption rate and technology. Upon evaluation, Weiss assigns letter grades indicating the crypto asset’s likelihood to succeed and its long-term sustainability. 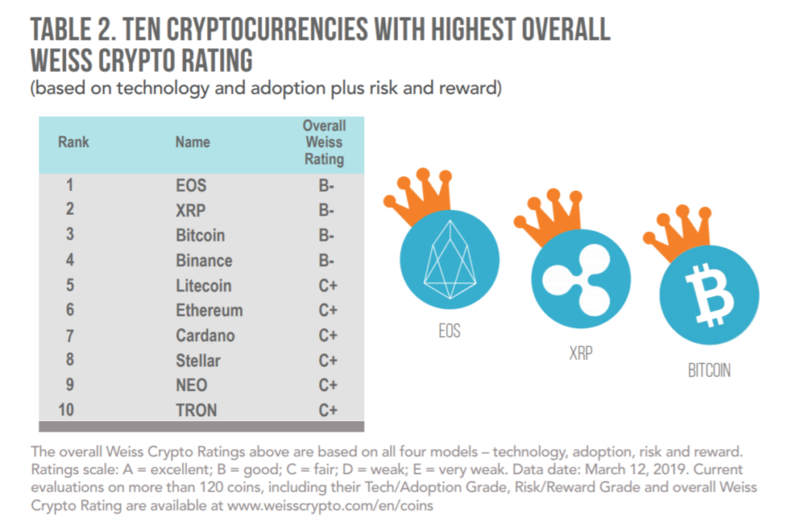 Weiss proposes that “ultimately, only cryptocurrencies boasting the best combination of adoption and technology will succeed.” And it rates Bitcoin, EOS, and XRP with the highest letter grade: “A” rate (excellent). The report argues that although the value of cryptocurrencies significantly declined in 2018, crypto technology continued to evolve, and new crypto assets were launched exhibiting faster processing speeds. As a result, adoption rates have increased. Since February 2018, the volume of user (on-chain) transactions among the ten most widely used cryptocurrencies has grown by 245 percent. Last year, Weiss had ranked Bitcoin with a “C-” rate under the all four-factor evaluation (adoption, technology, risk, and reward). At that time, Weiss explained that Bitcoin had obtained this rating was because the currency was being afflicted by significant transaction delays and high transaction costs. It should also be noted that Weiss consideres to still be “the proven leader in adoption.” What’s more Bitcoin doesn’t have much competition even among high-ranking altcoins are vying for different markets. Bitcoin, the original cryptocurrency, is still the proven leader in adoption… Like gold bullion, its value is not controlled by monetary authorities, and it can be a safe haven in times of turmoil. Unlike the yellow metal, it costs virtually nothing to store or transport. What do you think about Weiss’ cryptocurrency ratings? Let us know in the comments below! The post Weiss Ratings: Bitcoin Best Positioned to Become a Popular Store of Value appeared first on Bitcoinist.com.